These two British Airways 747 pictures are my favorite pictures from my entire commercial aviation photography collection so far. They may not be perfect from a technical point of view, but they represent everything I was shooting for over the past several months. If you’ve been paying attention, you will remember that my primary focus at this stage of my photographic life is to focus on powerful images involving special aircraft. First of all, I really like the composition of both. The British Airways 747’s park at the very end of the American Airlines gates in the old section of terminal 2 at SAN (terminal 2 east), and I shot these pictures from the Delta Airlines gates from terminal 2 west. It was a bit difficult to get a clear view of the aircraft while Delta jets were parked at the gate I was shooting at, but I managed to make it work both times. 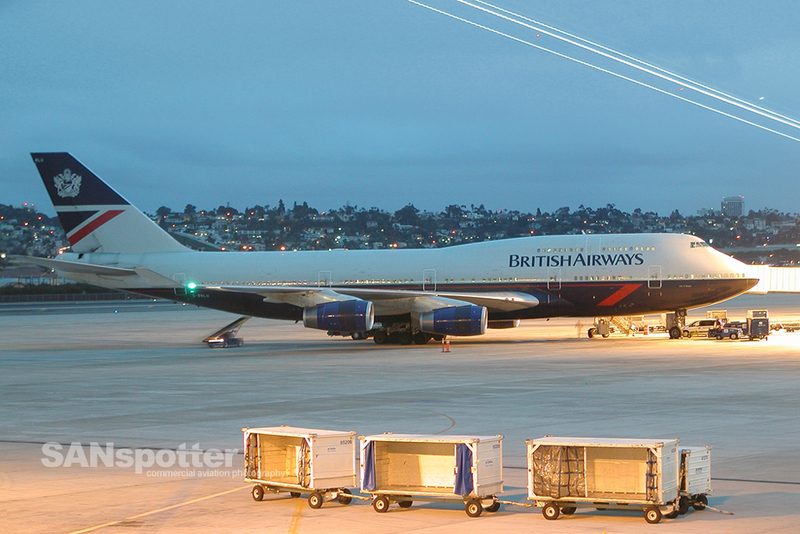 The photo featuring the BA 747 in the Union Jack livery (G-CIVI) was photographed on February 20th of this year. I really like the colors of this shot – the way the dark blue sky contrasts with the beige concrete beneath is a perfect match for the colors of that fantastic Union Jack scheme. The nose of the aircraft is a little blown out, but otherwise, this was exactly the image I was trying to get. The other British Airways 747 (C-BNLU) wasn’t shot in total darkness. It was photographed on March 9th, of this year, about an hour earlier than my previous BA 747 image. The colors aren’t as nice as that other one, but what makes this shot special is the streak of light passing behind it – all thanks to the lights of a departing aircraft off runway 27. Without that extra little detail, I don’t think this shot would have been all that special. I guess that’s what makes photography interesting – it’s hard to know what you’re going to get until you press the shutter button! Anyway, British Airways is going to start using the 777-200 to SAN in late April, so getting these pictures was a rather high priority for me. I know that we are never going to see a BA 747 in San Diego again, so I tried as best as I could to get decent pictures of them before they were gone for good. I think I did very well, thank you very much. Unemployed and bored – might as well spend some time taking pictures, right?